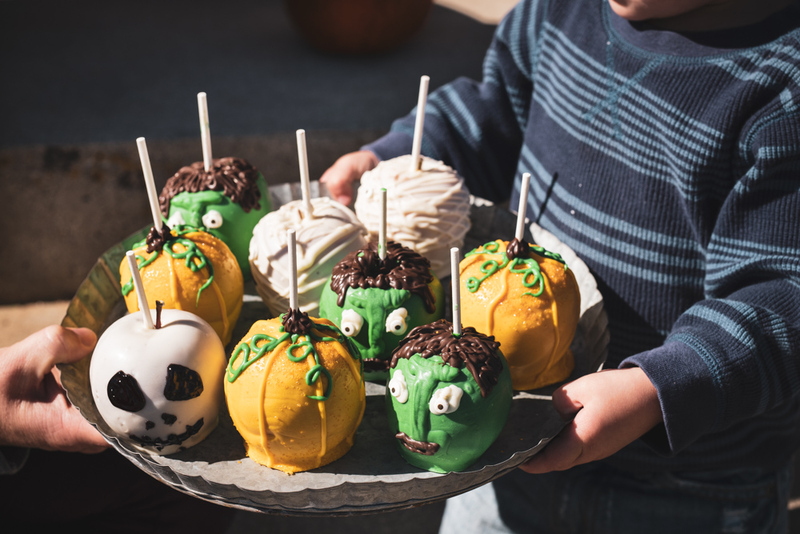 Get spooky with our pint-sized dipped Rockit® apple Halloween monsters. This kid-friendly activity is a chance to get creative by making edible goblins, witches, skulls, mummies, and more! 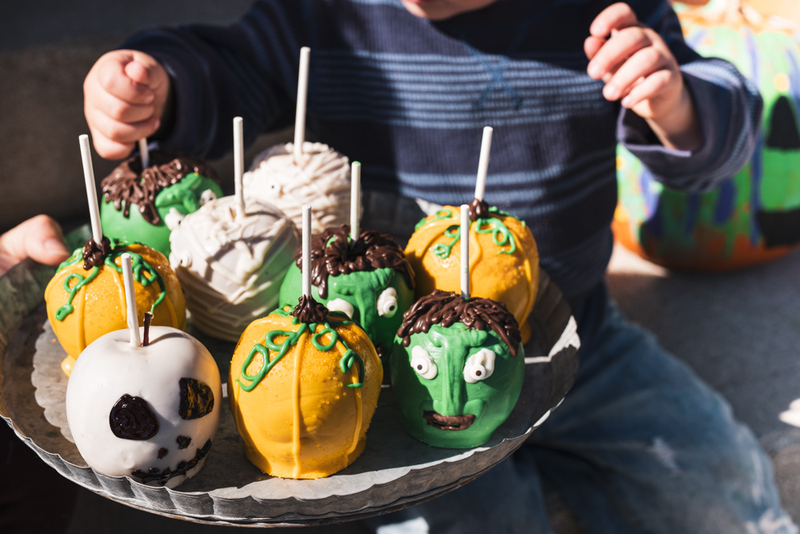 Rockit® apples are perfect for these dipped Halloween treats as they are child-sized and in season. Assorted decorations of choice: colored sugar sprinkles, candied eyes, frosting pens, etc. Push a candy stick into the top of each apple and push it down about half way through the Rockit®. Starting with one color, melt the chocolate in a double boiler or in the microwave by cooking for 5 seconds at a time and stirring in-between. Be careful not to burn chocolate. Dip apples one at a time until completely covered, making sure to hold each apple over the bowl to let excess chocolate drip into it. Place dipped apples on parchment or wax paper to set. 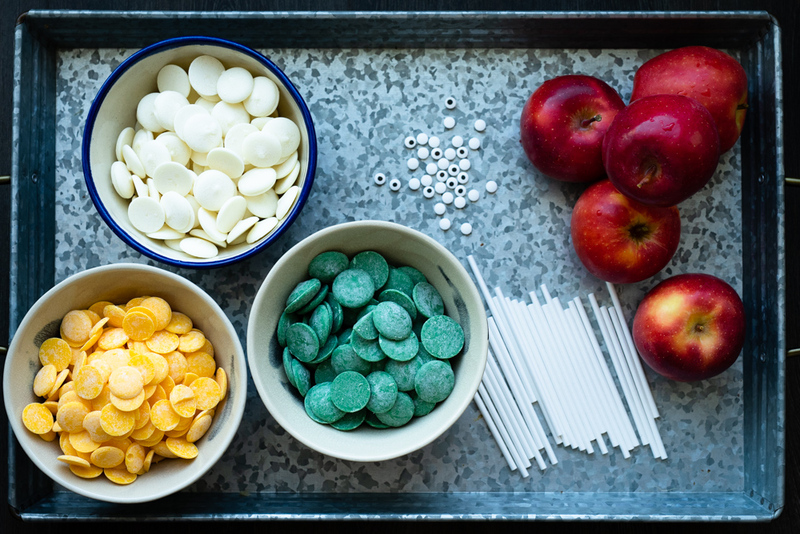 If using sprinkles add to the apples before the chocolate sets. If you wish, melt a different colored chocolate and repeat. Ultimately this will depend on your planned designs. We recommend the following base coats: white for skulls and mummies, green for goblins and witches, and orange for pumpkins. Repeat process until all apples are covered in a base coat. Once the base coat has set, create faces and accents on the apples. Place a few tablespoons of melted chocolate in a plastic zip lock bag, squeeze the chocolate to one corner of the bag and snip a very small hole in the end if the corner, use as a piping bag to draw on the apples. Use a separate piping bag for each color. Set aside until the chocolate is set and can be handled. Serve immediately or wrap individually, apples will last at room temperature for 1 day or store in the refrigerator for up to 3 days. Do not try to use water-based food coloring to tint white chocolate instead of using store-bought colored chocolate. The results won’t turn out well!